[BB-Blog]: Rethinking a newspaper graphic. A simple change, but so smart. 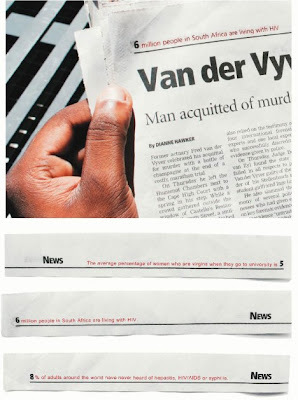 To commemorate World AIDS day on December 1st the South African newspaper Cape Argus used their page numbers on the top of every page of the newspaper to educate the public on statistics relating to the AIDS pandemic in South Africa. All the statistics were collected from UNICEF and the South African Department of Health.